Perhaps the most infamous Canadian city to share its moniker with another metropolis across the pond, London, Ontario is a wonderful place to live and travel. One of the unique ways London is attracting a younger work force is through their London Music Office which promotes the local music scene. By attracting musicians to come to London or for local residents to develop their musical talent, the city is able to attract both tourism revenue as well as make the city an attractive place to for a younger work force. London also has a public art program where local artists can have their work displayed in community areas either by sale, commission or donation. Many property owners don’t realize how much they could save by upgrading their heating or cooling units. By replacing a 10 year old heating system with an energy efficient system with an AFUE (Annual Fuel Utilization Efficiency) of 96 can save you 45 per cent on your energy bills and 55 per cent on your environmental emissions. In fact, an AFUE of 96 refers to the amount of cents out of a dollar that go directly towards heating your home. London is also attractive for its relatively affordable housing market. In April 2017, the average price of a detached two story home was $506,998. While this may seem affordable compared to the Toronto housing market, many still struggle with the expenses that come with owning their home, such as high energy bills. Luckily, there is an option for property owners in London to take advantage of a high efficiency furnace or central air conditioning rental. In Ontario an upgrade of an older heating or cooling unit to an energy efficient heating or cooling system can qualify you for as much as $650 in government rebates. With a furnace rental, we will even apply for these rebates for you. In addition, you can also qualify for additional rebates from your local gas company. The savings don’t end there. Your rental agreement includes free installation, often as soon as the next day. We can also remove your old unit(s) and install up to 15 feet of duct work absolutely free. We also try to work with all types of credit situations. So as long as you own your property there is a good chance you’ll be approved. By choosing a rental agreement, you are choosing quality products. 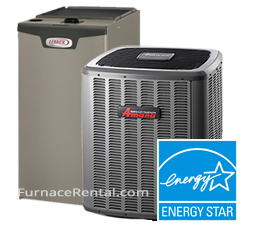 We use only the top brands like Lennox, Amana, and Goodman. When you choose a rental agreement, you are getting a quality product in your home or business. You are also choosing the protection that comes with having a team that is happy to stand behind their products. In order to continue to keep your energy bills low, your rental agreement includes regular maintenance. We will come to your home to make sure that your heating and or cooling system are working properly and as efficiently as possible. If for any reason your system stops working properly, we also have you covered. Our clients have access to an emergency line that is open 24 hours a day, seven days a week. By calling our emergency line, we will expedite a licensed service professional to your home to fix your issue as soon as possible. Instead of charging premium the premium rates that would apply with traditional financing measures, our repair services are completely covered with your rental agreement. If for any reason we are unable to repair your unit, we will replace it, absolutely free. Entering into a rental agreement is an easy way to enhance the value of your home without paying any upfront costs. Rental agreements can easily be transferred with the buying and selling of your property. Business and property owners can also benefit from rental agreements. The affordable monthly payments can easily be integrated into the monthly business budget or monthly rental fees. This eliminates the worry of big ticket costs associated with system failures. In addition the a predictable cost, the higher efficiency heating and cooling systems also help to lower heating and cooling costs for tenants. By having a simplified method for arranging for service and maintenance less valuable business hours are lost searching for quotes and referrals to HVAC professionals.